FINALLY—healthy meets easy with one-and-done recipes from The Healthy Sheet Pan Cookbook.When your day goes from busy to busier, one simple pan is all you need to serve your family healthy, homemade meals. 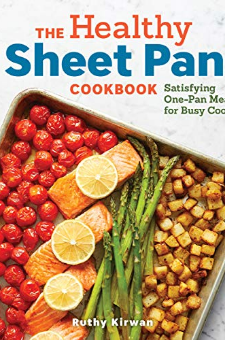 From the oven to your table, The Healthy Sheet Pan Cookbook makes good food easy-to-do.Every recipe in this cookbook combines all the ingredients you need for a completely tasty main course and side in the same pan. With short prep times—and even quicker cleanup—The Healthy Sheet Pan Cookbook is your everyday solution to the classic conundrum: What’s for dinner?Wake up with Mango Coconut Granola for breakfast or wind down the day with Spanish Chicken “Paella” and Rice, The Healthy Sheet Pan Cookbook simplifies healthy eating with:Sheet pan basics to get you started with pantry must-haves, recipe shortcuts, and fool-proof formulas for perfectly cooked meals.60 everyday recipes that include breakfasts, hearty dinners, vegetarian crowd-pleasers, and more.Handy recipe labels so you can quickly choose what’s on the menu: 5-Ingredient, Dairy-Free, Family-Friendly, Gluten-Free, Great for Leftovers, Quick Prep, or Vegan recipes.No matter how busy your day, your dinner can be healthy and easy. Bon Appétit.